You are here: Home / Left-Right-Center… What is it? 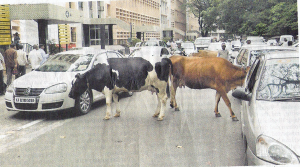 This is a story about the road traffic in Bangalore. When you were here last month for our Sweetie’s Birthday, you would have experienced the terrific traffic. It is chaotic and confusing. Ths page is designed as if you’re travelling in a car,(you have to turn and U turn ) you can see your position on the “Road map” shown on the bottom tight of the page. Most of the pictures are shot by me while driving. You “feel” the traffic from a driver’s seat.The above title shows the seriousness on the traffic in Bangalore. The police are at their best, but in vain sometimes. The Bangalore Traffic Police have many Avatars and we show some of them in this story. Scrolling not enabled on page 1….so I could not read the full comment. One of the few things common in all cities (not only major) of India. The problem is in managing. Singapore you need a permit from Govt explaining why you need to use car. In Manila odd and even regd plate numbers are to be used alternative days. The reason for this the roads can not be widened any-further. so far we are of opinion, B’lore= metro+a/c bus+cultured crowd & neat roads!